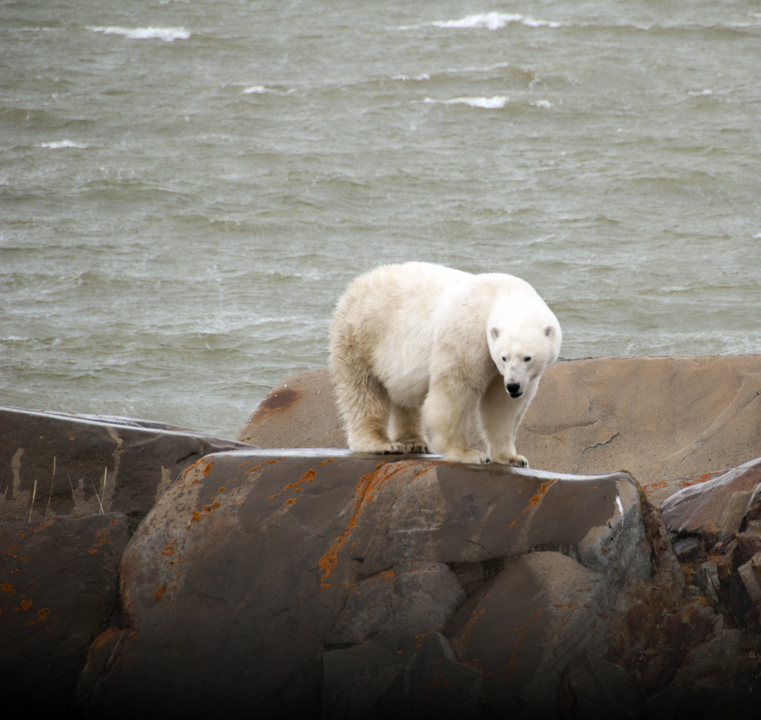 A pregnant polar bear along Hudson Bay. Photo by Karen Glenn. 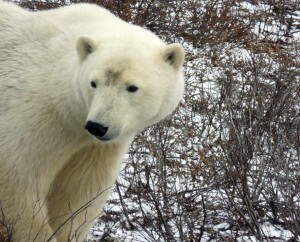 We saw the first polar bear even before we reached the Tundra Lodge. Devon, our driver, stopped the Polar Rover as Leah, one of our guides, pointed out the pregnant female resting on the rocks overlooking Hudson Bay. All 18 guests shot photos out the windows or stood on the open back platform absorbed in watching. In the Polar Rover, a giant bus with wide aisles, huge wheels and window seats for all, we were up high and safe from any bears. The day was windy and overcast, but the tundra was starkly beautiful. Red willow and green and orange lichen dotted a landscape crisscrossed with streams and small kettle lakes. Mama bear moved from rock to rock as the guides brought out lunch—soup, a choice of sandwiches, pasta salad, homemade cookies, and hot chocolate. It was the first time, but not the last, that we would enjoy meals in the presence of majestic polar bears. The Polar Rover. Photo by Karen Glenn. After lunch, the Polar Rover negotiated former military roads, bumping over rocks and through small lakes at 5-to-10 miles-an-hour. Our destination was the Tundra Lodge a few miles outside Churchill, Manitoba, the “polar bear capital of the world.” Bears gather each October and November, waiting for Hudson Bay to freeze so they can hunt ring seals on the ice. The Churchill area is first to freeze; rivers run into the bay there, and fresh water freezes faster than salt. The Tundra Lodge. Photo by Karen Glenn. At the lodge, another treat awaited us. A five-year-old bear was sleeping beneath its wheels. 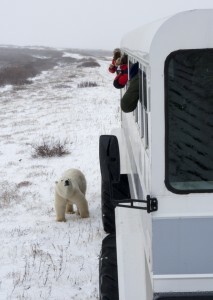 He crawled out to watch as the Polar Rover docked with the Tundra Lodge. During the three and a half days we spent there, our feet wouldn’t touch outside ground. Laid out like a train, the lodge is positioned at each season’s start for optimal polar bear viewing. It has two sleeping cars, a lounge, a dining room with an open kitchen, and a staff car. There is no wifi or other communication. In the sleeping cars, guests have individual compartments, each with a single bunk, a window, and a luggage shelf. One sleeping car has one bathroom, the other two. After settling in, we met at 5p.m. for hors d’oeuvres and drinks. Then it was on to a tasty dinner of spinach salad with mandarin oranges, honey-lime chicken, wild rice, roasted vegetables, and chocolate mousse, prepared by chefs Sasha and Beverley. "Buddy." Photo by Karen Glenn. While we ate, we kept an eye on our resident bear, whom we named Buddy. Buddy was as interested in us as were in him. He stretched out tall against the lodge trying to look in the windows. He poked his nose up under the platforms between cars, staring at us through the grate. He entertained us with somersaults, rolling on his back, feet up in happy baby pose. After dinner, we had our first presentation. 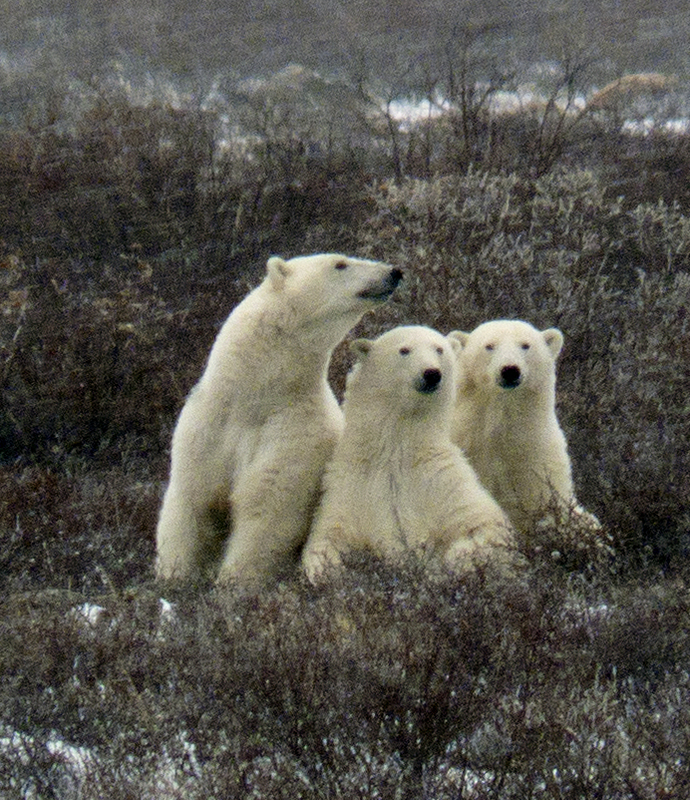 Leah and Rinie, our other guide, are bear experts, and each night presented a slide show filled with polar bear lore. We learned about everything from the danger global warming poses to their survival to the bears’ reproductive habits. "Buddy" checking out the Tundra Lodge. Photo by Karen Glenn. The next day began with 7a.m. breakfast followed by Polar Rover excursions, lunch, more Polar Rover excursions, happy hour, dinner, and presentation. The group bonded as we shared everything from pork spaetzle to sightings of caribou, ptarmigans, arctic foxes, and a mother bear with two cubs. But the true glue was Buddy. So we were upset when we woke up one morning and Buddy was missing. Sasha revealed that a bigger bear had chased Buddy away during the night. We worried about him and, in retaliation, named the other bear Baddy. We breathed a collective sigh of relief a little later when Buddy emerged from his hiding place in the willows and greeted us at the Polar Rover. Mama bear with two cubs. Photo by Karen Glenn. 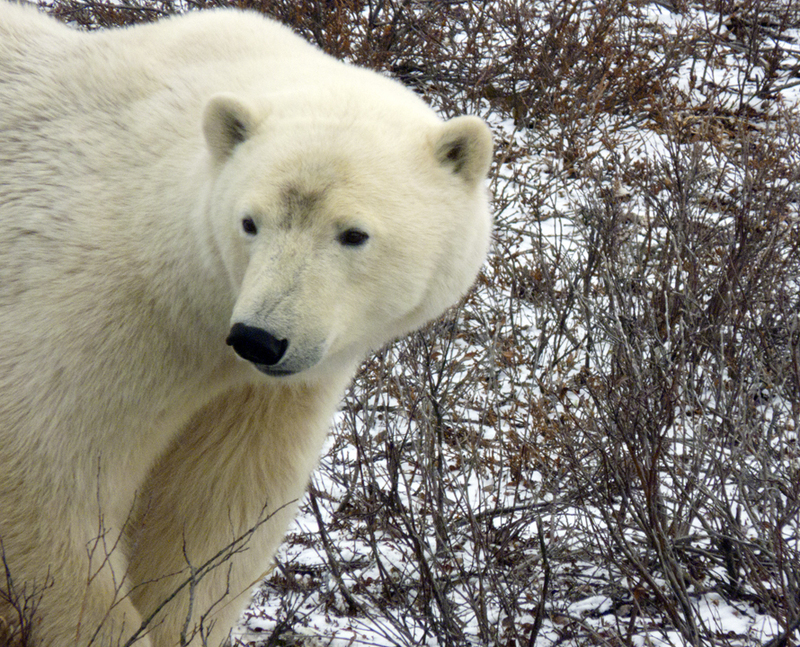 When we left a few days later to spend time in Churchill–visiting museums, going dog sledding or helicoptering (optional), shopping, and lunching–Leah talked about “polar etiquette.” You never know how many bears you’ll see on a trip. Nature is a crapshoot, as is the exact time the bay freezes over. Come too early and few bears will have arrived. Come too late, and the bears will have left. So one group should never tell another how many bears they’ve seen. You don’t want to raise or douse expectations. So like Leah advised, I’ll just say I had a “good experience.” Or maybe I won’t. I’ll just tell the truth: I had a magnificent one. 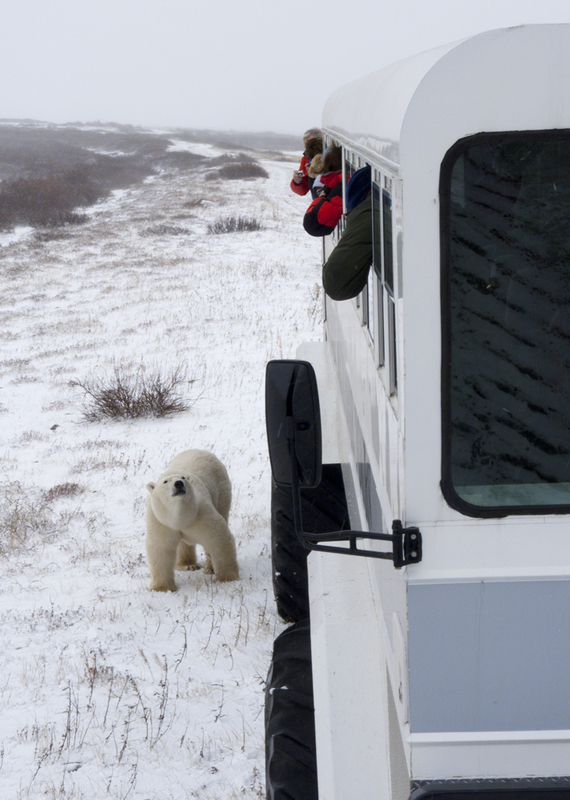 How to Go: Natural Habitat Adventures runs the Tundra Lodge Adventure tours, as well as other polar bear tours, each October and November. Prices for the Tundra Lodge Adventure begin at $5,995, including internal airfare, lodging in Winnipeg, and meals. Other NatHab polar bear tours begin at $4,595. For information, visit www.nathab.com, or call 1-800/543-8917. Oh, to have $5000+ for such an experience! This photographer’s splendid gallery is well worth visiting, providing a chance to travel worldwide without leaving your home! Her poetry, songs and stories are equally valuable tapestries. I can brag a little on her since she is my favorite cousin and has been telling me stories since I was a small child. Thank you, Karen, for all your shared insights. What an amazing experience! I’ve enjoyed your travelogue, very well done!